Ace of Wands – It’s a Go! Aces are equivalent to the number 1 and as such indicate very initial beginnings and are very powerful and forceful. Aces are also raw expressions of the element that they represent. 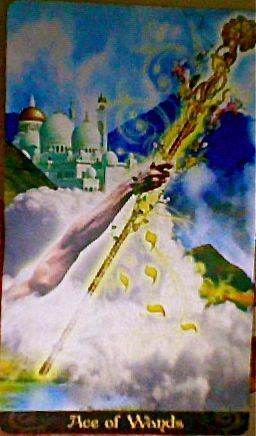 Ace of Wands are part of the Suite of Wands and its element is fire, therefore, the Ace of Wands represents the purest form of fire. Some Key Words for the Ace of Wands are new beginnings, inspiration, power, creativity, motivation, action, potential, enthusiasm, and personal growth. On the overall, the Ace of Wands can indicate the start of an exciting and enthusiastic new life cycle. The Ace of Wands indicates a better start at the beginning of some situation. The Ace of Wands is also seen as a phalllic symbol which indicate great sexual energy in a relationship. When the Ace of Wands appears in a reading…… It’s a Go! When the Ace of Wands appears reversed, it can indicate that plans have not worked out could be because that’s how the cookie crumbled or that there were too may irons in the fire. What are your thoughts on the Ace of Wands? This entry was posted in Suit of Wands and tagged Ace of Wands. Bookmark the permalink.